“Going to Wings” is the story of a young woman who struggles to fit herself into the mold of a wife from the Deep South in the 1970’s. 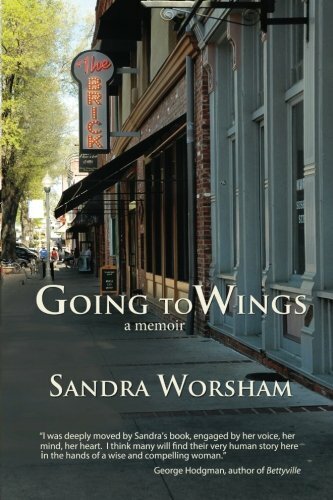 In her memoir, Sandra Worsham is uncomfortable with who she is until she gains new perspectives outside the realm of her small conservative circle. She finds a way to break from the stereotypic role of a woman who marries to be a housewife when she befriends the town’s eccentric - a self-made woman who lights up her world. With each new experience, Sandra begins to see that she can surmount the barricade to live the life she is destined, as a gay woman. Sandra takes on the persona of the bold women she connects with through church and school but the potential scandal these relationships bring to her family prevents her from sustaining them. To purge herself and find her innate goodness, she joins the Catholic Church. This becomes Sandra’s way of gaining redemption for her “mistakes.” Shielded by her faith, Sandra eventually comes to terms with living alone, the death of her mother and the fact that she cannot express the love she feels for her longtime companion. The tests Sandra endures, her ties to her mother and marriage, and her strong female friendships grant her the strength to fight for her independence and sense of self. Part memoir, part historical fiction, “Going to Wings” is a look back at 1970s women’s issues that are as significant for this time as they were back then. Sandra Worsham’s story contains the best descriptive writing that I have read in a long time. Through her narrative, you participate in the culture of the seventies in the southern Bible belt. The author’s references to door-to-door salesmen (who are welcome inside), Simon and Garfunkel, pink foam hair rollers and lemon Jell-O cake generate amusing flashbacks for those of us who lived during this time. Filled with heart wrenching truths, “Going to Wings” will take you on a tender journey, lifting you to a place you may have never been before. For everyone who is looking for their authentic self, this book will give you the wings to soar upward.